The launchers of Russian-made S-300 missile defense systems deployed to Syria have been erected, new satellite images released on Tuesday showed. 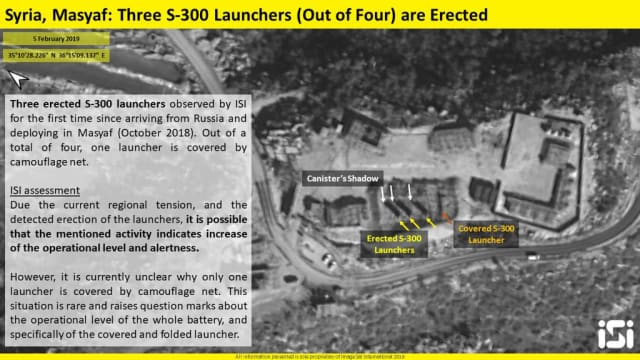 “Due to the current regional tension and the detected erection of the launchers it is possible that the mentioned activity indicates an increase of the operational level and alertness,” ImageSat said in their assessment of the images. The camouflaging of the fourth launcher “is rare and raises question marks about the operational level of the whole battery and specifically of the covered and folded launcher,” they added. Russia delivered the launcher, radar and command and control vehicle of the advanced surface-to-air missile system to the regime of Syrian President Bashar Assad in early October as a response to the downing of a Russian reconnaissance plane by Syrian air defenses during an Israeli airstrike on Iranian targets the previous month. The incident has led to one of the lowest points in the relationship between Jerusalem and Moscow in years. Earlier on Tuesday, Prime Minister Benjamin Netanyahu announced that he would be heading to Moscow later in the monthto meet with Russian President Vladimir Putin, their first-such official meeting since the crisis. With the help of the Russians, Iranians and Hezbollah, Assad has regained control over the majority of Syria and is rebuilding his army, focusing first on intelligence and air defense divisions which could pose a threat to Israeli aircraft. Syrian air defenses are largely antiquated Soviet-era systems, with SA-2s, SA-5s and SA-6s, as well as the more sophisticated tactical surface-to-air missiles, such as the SA-17s and SA-22 systems. Moscow has also supplied the short-range Pantsir S-1 to the Assad regime. The advanced S-300 would be a major upgrade to the Syrian air defenses and would pose a threat to Israeli jets on missions as the long-range missile defense system can track objects, such as aircraft and ballistic missiles, over a range of 300 kilometers. A full battalion includes six launcher vehicles, with each vehicle carrying four missile containers for a total of 24 missiles, as well as command-and-control and long-range radar detection vehicles. Israel has been carrying out airstrikes in the war-torn country against Hezbollah and Iranian targets. While the number of airstrikes in Syria attributed to the Jewish state has dropped since the downing of the Russian plane, Israel has stressed that it will continue to operate when necessary.